If you like to go for a day's picnic in a wonderful nature's surrounding that has a lake with mountains in all sides, then choose Senchal Lake and the sanctuary as the place. It's about 11kms (7 miles) from Darjeeling town and can be reached via Ghoom and Jorebunglow. Senchal is at an elevation of about 8,160ft (i.e. 2,490 meters). However the sanctuary spreads across elevations of 1500 to 2600 meters. 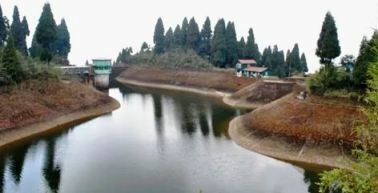 Senchal Lake is part of the Senchal Sanctuary which is one of the oldest wildlife sanctuaries of Darjeeling hills. The lake is fed by a mountain spring and is the main reservoir for water supply to the town. The narrow longish Senchal Lake is surrounded by trees and forests in all sides. However the main forest area is a bit bar from the lake. 40% of the forest is natural and the balance is man made. But the blend is so nice that you won't be able to make the difference. The forest has different kinds of trees and plantation including oak forest, pines and Birch. There are over 350 types of flowering plants in this area including Rhodendrons and Orchids. The entire Senchal sanctuary covers an area of about 39 sq. km. including the lake. It is actually the south east extension of the Singhalila National Park. This sanctuary is considered one of the oldest in India and was opened in 1915. Although access to the sanctuary is restricted, you can take special permission from the ranger's office at Jorebunglow and take a guide to go around the area. A road (although not in a very good condition) goes through the Sanctuary and you can ask the driver to keep driving along as you watch the flora and the fauna. There are different types of wildlife that can be seen in the dense forest here. Animals include Himalayan black bears, barking deers, leopards, monkeys, flying squirrels, wild dogs, scaly ant eaters and many more. The sanctuary is also great for bird watching. You can commonly see golden back woodpecker, emerald cuckoos, black-backed pheasant, red jungle fowl, hornbills, Babblers, Sunbirds etc. There is a 9-hole golf course at the Senchal area which is supposed to be one of the highest golf courses in the world. It has a club house as well. However the course can be accessed through the Senchal road that leads to the Tiger Hill and is little away from the lake. If you are planning to see the sunrise from Tiger Hill early in the morning, it can be a great idea to combine that visit with a day picnic at the Senchal Lake. Both the places are close to each other. From Tiger Hill you will need to come down to Jorebunglow and then take an uphill narrow road towards Senchal Lake. You will need to collect admission ticket from the Ranger's office at Jorebunglow to access the Senchal area. The sanctuary and access to the lake is closed during the monsoon time and usually reopens after September 15th. A nice forest lodge known as Rambi Forest Rest House is located right inside the forest. It is managed by the Wild Life Division of Darjeeling. It has two rooms. Although it is mainly meant for official use, if free the rooms are also offered to public (Indicative rate Rs. 1000/- per room, Updated January 2016). The Senchal area in Darjeeling is located towards the South-Eastern side of the town. There is a narrow road from Jorebunglow known as the old Military Road that leads towards the Senchal Lake. It's about 3km from Ghoom. So the total distance from Darjeeling town is about 11kms and takes about 40 minutes by car to reach. It's best to book a private cab/vehicle for visiting the place as getting a return transport is a problem. Check out Ghoom & Its Map to see the way to the lake.